SDRs and accounts executives are an integral part of any Bay Area startup. Both sales development representatives and account executives spend their day sales call, meetings, connecting and networking with various departments of the startup and community. 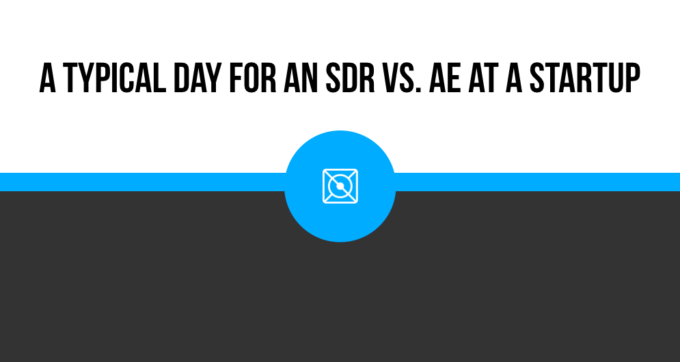 We hope to shed light on a typical day of an SDR vs. AE and give tips to consider if you are growing your team and doing AE or SDR hiring for your team. Connecting with SDR and the Marketing teams: A successful AE is constantly generating leads. To develop a better understanding of the types of leads coming in, AE’s frequently meet with the SDR and marketing team. They touch-base frequently with the marketing team and because marketing usually creates material for the AE and are driving leads. Demos/ Calls: AEs typically spend 4 to 5 hours on the phone every day. Demos/calls are scheduled throughout the day and meetings are set via their sales development representative. If you are hiring sales development representatives, it will be important to make sure they have proper experience — our sales bootcamp fellowship offers real world experience setting meetings and cold calling. Researching and Prospecting: AEs have to generate a portion of their outbound leads by prospecting. 1-2 hours of their day is usually spent researching and looking for new accounts and opportunities. Our sales bootcamp covers the most popular tools including Owler and ZenProspect to speed up this process. Many new accounts executives make the mistake of not managing their time and day efficiently. While it is good to be spontaneous once in a while, AEs must have time blocks so that they can complete specific tasks. New AEs should utilize their Google filters, calendars, and should think about using Streak, to help become more organized with their daily and weekly tasks. The majority of an SDR’s time revolves around lead generation instead of closing new leads. The effectiveness of an SDR is measured by how successfully they are able to build up the sales pipeline and set meetings for their account executives. SDRs generally help with the lead qualification process while accounts executives focus their energy on closing deals. If you are recruiting for sales development representatives, keep in mind that you want people that bring a lot of energy, know their processes, able to set meetings on the phone, and it will make a big difference when scaling and hiring sales development representatives. Researching and Responding: SDRs spend a lot of their time prospecting for new leads. Through research, SDRs are able to find relevant insight according to personas. SDRs should leverage social selling and use LinkedIn to check if any customer has visited their profile. Prioritizing Top Prospects: SDRs spend a significant amount of their time on the phone to get in touch with their top customers. However, it is important to get to a quick “no” with any prospects and continue to focus on ones that have the highest potential for growth. Cold Calling Blocks: Sales development representatives should make sure they are spending time doing their job! It is easy to work on stuff that isn’t challenging, but remember that when you were hired as a sales development representative, your primary goal is to set meetings and help drive revenue. Meet with Product and Marketing with free time: Become a master of your free time. Give yourself a few hours a week to meet with Product and Marketing team to ask questions, learn about when they are working on, and share this info with the account executive you are working with. If you are thinking about becoming an AE or SDR, or even recruiting for these roles for your pay area startup, check out How To Transfer Into a Closing Role Workshop with our team!